Winn’s photographs are concerned with his identity as a gay, Jewish man living with AIDS. 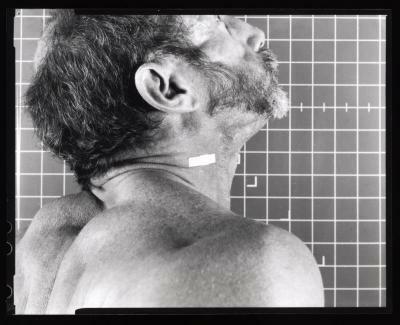 In “The Band-AID Series”, Winn photographed himself removed from his personal, familial, and religious identity and instead used a grid pattern as a backdrop to map out his body in a progression of detailed photographs. By placing a Band-Aid over each location in which blood was taken or an injection was given to treat his illness, Winn has provided a detailed survey of his own condition. Winn, along with a number of other individuals living with AIDS, was fortunate enough to return to a state of improved health as a result of the ‘cocktail’-antiviral medications and drug therapies that have helped individuals living with AIDS keep the disease in check. However the drug cocktails have also created the illusion that the AIDS crisis has passed or is near its end, which is furthest from the truth. While the cocktails have helped a number of individuals return to their lives, they yield varying results for individuals taking the medications and require a strict regimen of how and when the drugs are taken. Albert J. Winn participated in Light Work’s Artist-in-Residence program in July 1999, and was also included in the exhibition Desire: Contemporary Photography from the Visual AIDS Archive Project, curated by Ernesto Pujol. Two images from his ongoing series “My Life Until Now” were presented in the exhibit and reproduced in Contact Sheet 103. Albert J. Winn died on May 20, 2014 at age 66 from complications of neuroendocrine carcinoma. He is buried at Ohev Shalom Cemetery in Brookhaven, Pennsylvania. In 1999, Light Work presented the exhibition desire, Contemporary Photography from the Visual AIDS Archive Project curated by Ernesto Pujol. Albert J. Winn was one of the fourteen featured artists in the exhibition. Two images from his ongoing series My Life Until Now were presented in the exhibit and reproduced in Contact Sheet 103. Winn's photographs are concerned with his identity as a gay, Jewish man living with AIDS. In the series My Life Until Now Winn photographed himself alone, and with family members, friends, and his partner in simple, everyday moments - relaxing at home, preparing a meal, observing Hanukkah. In each case the artist meets the gaze of the camera unabashedly, under-scoring the continuance of life, relationships, and rituals. Winn's connection to his Jewish heritage is not only a predominant part of his daily life but has become a critical component in his work. In an installation at the Judah L. Magnus Museum entitled Blood on the Doorpost, The AIDS Mezuzah, Winn used a vial of his own blood attached to a doorframe with accompanying religious texts filled with references to blood and plague. The work generated controversy for the museum because it incorporated the artist's blood, what some considered to be a dangerous substance. In the image and text piece Akedah, Winn draws a parallel between his AIDS treatment and the ritual of prayer, and how both activities leave their mark and require their daily observance. Winn, along with a number of other individuals living with AIDS, has been fortunate enough to return to a state of improved health as a result of the 'cocktail'-antiviral medications and drug therapies that have helped individuals living with AIDS keep the disease in check. However the drug cocktails have also created the illusion that the AIDS crisis has passed or is near its end, which is furthest from the truth, each day another 16,000 individuals are diagnosed HIV positive. While the cocktails have helped a number of individuals return to their lives, they yield varying results for individuals taking the medications and require a strict regimen of how and when the drugs are taken. In his most recent work reproduced here, The Band-AID Series, Winn photographed himself removed from his personal, familial, and religious identity and instead used a grid pattern as a backdrop to map out his body in a progression of detailed photographs. By placing a Band-Aid over each location in which blood was taken or an injection was given to treat his illness, Winn has provided a detailed survey of his own condition. In discussions of the AIDS pandemic the prevailing metaphor is that of the battle-where attacks are waged inside the body and strict regimens of medication fortify the individual's defenses and halt the disease's advance, but where research and drug therapies have helped some this is only a temporary truce. Winn's photogrammetric images act as reconnaissance photographs that reveal positions of attack and defense illustrating where the lines are drawn and battle goes on. Albert J. Winn lives in Los Angeles, CA, and participated in Light Work's Artist-in-Residence program in July 1999. Every month, because of my illness, I need to undergo a blood test. During the process, a tourniquet is bound tightly about my upper arm. At times when I’ve been on a study protocol for an experimental medicine, I’ve had my blood drawn every day. Having my blood drawn has become a ritual in what sometimes seems is a new practice, an AIDS ritual. Over time, I’ve transformed this ritual in relation to my Judaism. I wonder if like Isaac, I am being sacrificed. This time to science. I pray that an angel will intercede and spare my life. When my arm is bound with a tourniquet and the veins bulge, I am reminded that I am bound to my illness. I look at the rubber strap and see tefillin. Sometimes the impression of the leather straps from the tefillin are still visible on my skin by the time the tourniquet is wrapped around my arm. The binding of the tefillin is a reminder of being bound to my heritage. The straps also make my veins bulge. Except for the needle stick, the binding feels the same.